If you’ve ever walked up to a deli and ordered bagels with lox, you were probably served cold smoked salmon. Over the years, these two terms have become blended in the Modern American vernacular, but these are actually two different foods treated to very different processes. Here’s the main difference: smoked salmon is cured and then smoked, whereas lox is only cured, typically in a salt brine and typically for longer periods of time, but not smoked. Smoked salmon is preserved with a combination of salting and smoking, so the flavor can be slightly salty and slightly smoky. Because lox is only brined, the flavor is very different. It’s much more briney and there’s no smoky flavor whatsoever. In appearance, these two delicious foods can look very similar. They have a smooth, silky texture and, if preserved using very fresh fish, will have a bright orange color. Smoked salmon is made by curing with salt and smoking whole salmon sides. There are two main types: cold-smoked salmon and hot-smoked salmon. Hot-smoked salmon is very flaky with a slightly drier texture. It tastes as if it’s been baked. This type of smoked salmon almost never gets confused with lox, because the look, texture, and taste are very different. On the other hand, because cold-smoked salmon has been smoked at very low temperatures, it has a milder smoky flavor, so it can get confused with lox more easily. 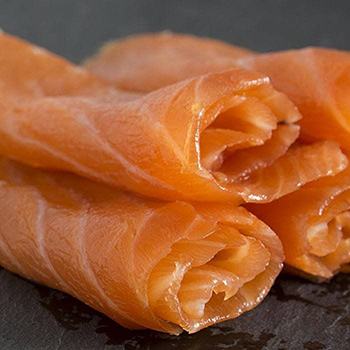 Lox (or laks) is made of salmon sides that have been preserved with brining, and brining only. Sometimes, flavors are added to the brine. Gravadlax, for example, is a traditional Nordic dish wherein dill and sugar is added at the time of brining to give the fish a bold dill flavor. Additionally, some sort of weight is typically placed on top of the fish during brining to keep it submerged. This really pounds in the flavor of the brine. We’re a smokehouse, so we don’t offer salmon that has only been brined. However we do have our own version of gravadlax, which features a delicate mix of spices and dill. It has been cold smoked to preserve the fresh flavor and texture of the salmon. Why do smoked salmon and lox get easily confused? Over the years, the words lox and smoked salmon have become intermingled. Older generations might still know the difference, but younger and middle-aged people often think that smoked salmon and lox is the same thing. A common “bagel and lox” recipe will often call for cold-smoked salmon. To make it even more confusing, the terms change in different areas of the country. What is simply called “smoked salmon” in the Pacific Northwest is called hot-smoked or Kippered Salmon in the Northeast to differentiate the hot-smoked style from the cold-smoked style. True traditional lox is growing increasingly uncommon, and as this happens, the word lox lives on in another form. Which one should you buy, cold smoked salmon or lox? Most likely, you’re wanting salmon with a fresh taste and a smooth, silky texture. You might be dreaming of salmon on bagels with cream cheese topped with capers and finely slivered red onions. If that’s the sort of salmon you’re after, then cold-smoked salmon is what you’re really looking for. In all honesty, if you knew you wanted the brine-only lox, then you would probably already have your favorite Yiddish deli on speed dial and wouldn’t be reading this post. It’s nearly guaranteed that anyone who isn’t sure of the difference actually wants cold-smoked salmon. The word lox has really evolved to mean just that. Of course, you’re welcome to keep using whatever term you like, but it’s best to use “cold-smoked salmon” to be sure there will be no confusion. If you say lox in California, no one will know what you’re talking about, but if you say it in New York, you might accidentally order the wrong thing! Do you have any other burning questions about smoking and all things salmon? Don’t hesitate to ask. We can be reached via email at hello@solexcatsmo.com or via phone at (845) 895-3361.